Srebrenica Genocide Blog: WHERE IS RADOVAN KARADZIC? Hilandar monastery on Mount Athos in Greece is the new hiding place of the former Bosnian Serbs' leader, Radovan Karadzic, Podgorica's weekly magazine Monitor writes in its latest edition. Revealing no sources, Monitor writes that Karadzic reached Mount Athos upon assistance of Russian intelligence services and Greek monks, and with American permission. According to Monitor, the ICTY most wanted war crimes refugee, is writing poetry and his memoirs in the Serbian monastery on Mount Athos. The magazine also claims that the former Yugoslav Defense Minister, Veljko Kadijevic, accused of war crimes by a Croatian court, is hiding in Moscow. Kadijevic is reportedly changing constantly locations, including Florida, Belgrade and Moscow. Radovan Karadzic’s brother accused the United States of violating a secret arrangement with the war criminal. 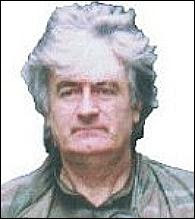 According to Luka Karadzic, Serb war crimes indictee Radovan Karadzic had arranged with the United States that he would disappear and in return, the US would not pursue him. Luka Karadzic told the Associated Press that U.S. envoy Richard Holbrooke had made the arrangement with Radovan Karadzic in 1996, a year after the UN’s war crimes tribunal in The Hague had indicted Karadzic of genocide and war crimes in Bosnia in the period from 1992 through 1995. I know that an arrangement existed with my brother. My brother kept his promise, but Holbrooke and the United States did not keep theirs, said Luka Karadzic. Holbrooke and the United States refuted such an arrangement with Radovan Karadzic several times. Karadzic disappeared in 1998 and has not been seen since. Sokesman for the U.S. State Department Ssean McCormack said last Friday that the claim about the arrangement between Karadzic and Holebrook was absolutely false. A former Republic of Srpska (RS) official has confirmed Radovan Karadžić and Richard Holbrooke made an agreement. In an interview with Banja Luka weekly Fokus, Gojko Kličković, former RS prime minister, said that former Bosnian Serb president Radovan Karadžić and then U.S. Balkans envoy Richard Holbrooke signed an agreement that allegedly granted Karadžić freedom in exchange for his giving up politics and disappearing from public view. “The agreement in question was signed on July 19, 1996, stipulating in five or six points the terms of the deal,” Kličković said. According to him, the two met in the RS presidential headquarters located in Pale at the time. Kličković claims he was present at the meeting. Kličković also said that Holbrooke persuaded Karadžić to acquiesce via Slobodan Milošević, adding he saw him last in 1997. The U.S. State Department has on several occasions issued flat denials of any such deals.